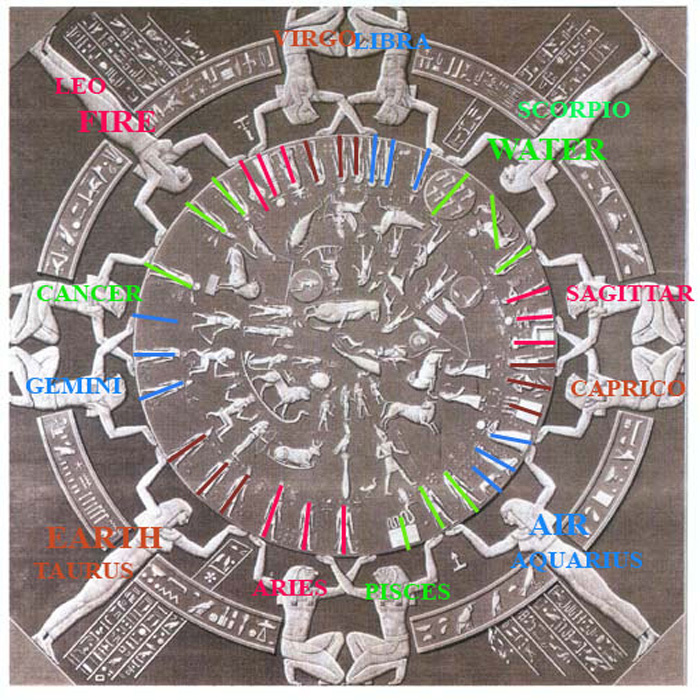 The decans correlate precisely with the Hindu alignment and the artwork of people born during the periods specified. The snake on the rock is Pisces 3rd decan. The alignment can be easily seen by cross examining the Hindu images on this site on the decans page. The "missing" decan of 3rd decan Gemini, Pheonix, is restored in it's proper location as shown on the original drawing by Vivant Denon. Copyright © 10 Iq week of Aj, (sept 14, 2012), Artstrology.com, Permission is granted to copy and redistribute this article for non-commercial purposes provided that the content remains complete without edit , full credit is given to Creator and the Ancestors, and a link is provided to Artstrology.com.